NEW Listing for 2017! 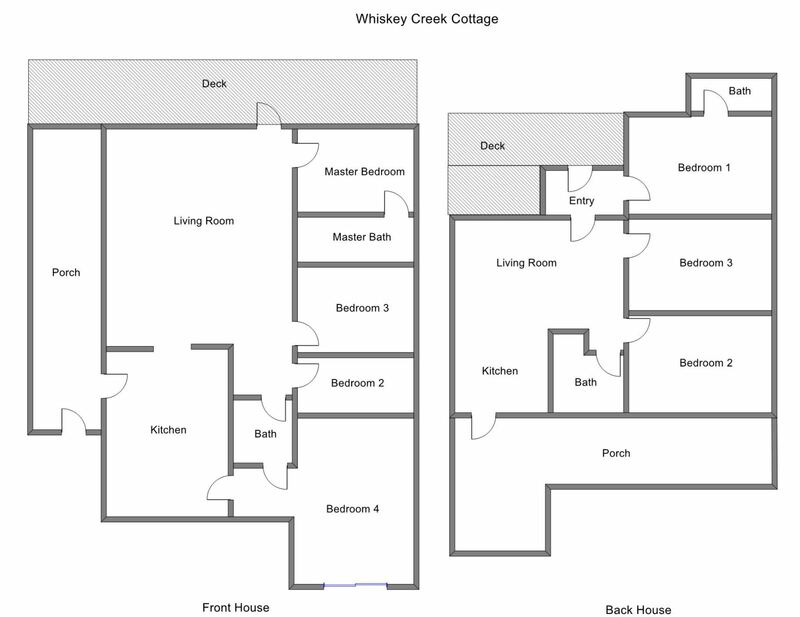 Whiskey Creek Cottage is located in the Silver Lake area right on Lake Michigan and just steps down to the private beach frontage. This Private Lake Michigan frontage vacation rental provides a peaceful setting for your entire family. There are two homes on the property, a Lake Front home and the guest home which sits behind the Lake Front home. This rental includes both homes and can occupy 18 guests. This vacation home is minutes away from all of your favorite "things to do!" A total of 7 bedrooms, 4 in the front home and 3 in the back home. The lake front home features 4 bedrooms and 2 full bathrooms. The master bedroom has a king bed, the second bedroom features a queen bed, bedroom #3 has a twin bed and bedroom #4 has two twin over full bunk beds. There is also a TV in the bunk room for entertainment. The back home features 3 bedrooms and 2 bathrooms. Bedroom #1 has a queen bed with full bath connected, bedroom #2 has two twin beds and bedroom #3 has a queen bed. There is also a sleeper sofa on the porch of the second cottage for additional sleeping! All very easy! Online and via email. Always got a prompt reply and during my one phone call my issue was resolved immediately. Such a wonderful property for a large group. We ended up only having 10 in our party and so there was so much space!!! Loved that we could all hang together in the front house living room or play games on the big table on the side porch. We had great weather for most of our stay, so the fabulous beach was our daytime camp-out. Loved the firepit area for nighttime s'mores. The main house kitchen had everything you might need for cooking. We did all of our meals at the house and always found whatever we needed. We used the back kitchen mostly for the extra refrigerator space. FYI: the front house fridge runs very cold. It was set at 5/10 and we ended up with frozen vegetables in the crisper drawer. We appreciated that there were a few beach chairs for our use, as half of us flew into Michigan, limiting what we could bring. My biggest suggestion to improve the stay was that there be a back-up propane tank for the grill. We were just starting our "steak" night BBQ when it ran out. We had no idea where to go to have it filled. My husband drove into Stoney Point and they directed him to the New Era Westco gas station, but it put a real damper on that meal. At the very least, get a tank with a gauge, so you aren't blindsided and leave instructions on where to go to refill. My other two smaller suggestions would be to stock the house with bigger bath towels (we actually thought they had forgot to leave us bath towels because I thought they were hand towels).....they were one star motel quality, and have a body wash or small soaps for the showers. If you are driving, bringing your own bigger bath towels or soap aren't a problem, but for those of us flying in, we don't have that luxury. However, those are all minor flaws in what we found to be a most delightful week at the Whisky Creek property! We will be back!! Had an issue with the power to garbage disposal. This kept us from using the dishwasher also. A staff member gave us email advice to resolve & when that didnt solve it he came out the next day & fixed it. We loved having a main Cottage plus a 2nd smaller one right behind it for our large group. Very nicely decorated with up to date bathrooms & all the amenities you could want for a week at the beach. 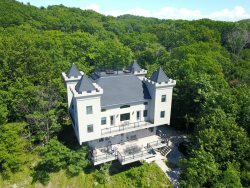 60 steps to a gorgeous private slice of Lake Michigan. Even a campground within walking distance for overflow guests. Everyone was very helpful while planning our trip. I would love to stay here every year. We would love to make this an annual vacation for our family. Delightful phone call with a lovely woman. We will return when our schedules allow. Our family is dealing with a LOT at the moment, from cancer to an estranged member to a child custody issue. We needed the time out to just laugh and make good memories. Thank you. It was pretty hands-off and done through email, which is completely fine. When I did call to speak with someone, she was absolutely delightful. We didn't have much interaction, as everything was so convenient online. I called to find out about the check-out procedures and was given the information by a very pleasant young woman who gave me the information needed. We very much enjoyed our stay, as did our kids and grandkids. It was a memorable vacation for us all. We didn't want to leave! Thank you so much! The Ross Family. The e mail communications were punctual and easily understood. We had a wonderful stay at Whiskey Creek Cottage. Easy to communicate with and follow up is excellent. Everyone was friendly and quick to respond. It was wonderful, we had a relaxing and an enjoyable vacation.